Acts 13:14 But they, passing on from Perga, came to Antioch of Pisidia. They went into the synagogue on the Sabbath day, and sat down. Acts 14:24 They passed through Pisidia, and came to Pamphylia. 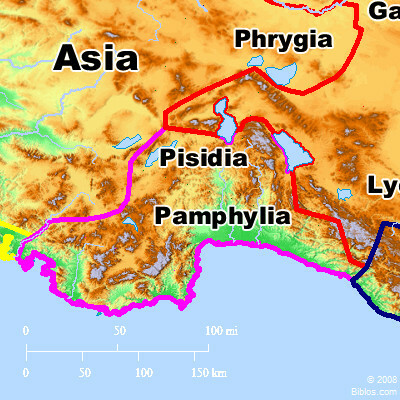 Pisidia, as a strict geographical term, was the name given to the huge block of mountain country stretching northward from the Taurus range where the latter overlooked the Pamphylian coast land, to the valleys which connected Apamea with Antioch, and Antioch with Iconium. It was bounded by Lycia on the West, by the Phrygian country on the North, and by Isauria on the East; but there is no natural boundary between Pisidia and Isauria, and the frontier was never strictly drawn. The name is used in its geographical sense in the Anabasis of Xenophon, who informs us that the Pisidians were independent of the king of Persia at the end of the 5th century B.C. Alexander the Great had difficulty in reducing the Pisidian cities, and throughout ancient history we find the Pisidian mountains described as the home of a turbulent and warlike people, given to robbery and pillage. The task of subjugating them was entrusted by the Romans to the Galatian king Amyntas, and, at his death in 25 B.C., Pisidia passed with the rest of his possessions into the Roman province Galatia. Augustus now took seriously in hand the pacification of Pisidia and the Isaurian mountains on the East Five military colonies were founded in Pisidia and the eastern mountains-Cremna, Comama, Olbasa, Parlais and Lystra-and all were connected by military roads with the main garrison city Antioch, which lay in Galatian Phrygia, near the northern border of Pisidia. An inscription discovered in 1912 shows that Quirinius, who is mentioned in Luke 2:2 as governor of Syria in the year of Christ's birth, was an honorary magistrate of the colony of Antioch; his connection with Antioch dates from his campaign against the Homonades-who had resisted and killed Amyntas-about 8 B.C. (see Ramsay in The Expositor, November, 1912, 385;, 406). The military system set up in Pisidia was based on that of Antioch, and from this fact, and from its proximity to Pisidia, Antioch derived its title "the Pisidian," which served to distinguish it from the other cities called Antioch. It is by a mistake arising from confusion with a later political arrangement that Antioch is designated "of Pisidia" in the majority of the manuscripts. Pisidia remained part of the province Galatia till 74 A.D., when the greater (southern) part of it was assigned to the new double province Lycia-Pamphylia, and the cities in this portion of Pisidia now ranked as Pamphylian. The northern part of Pisidia continued to belong to Galatia, until, in the time of Diocletian, the southern part of the province Galatia (including the cities of Antioch and Iconium), with parts of Lycaonia and Asia, were formed Into a province called Pisidia, with Antioch as capital. Antioch was now for the first time correctly described as a city "of Pisidia," although there is reason to believe that the term "Pisidia" had already been extended northward in popular usage to include part at least of the Phrygian region of Galatia. This perhaps explains the reading "Antioch of Pisidia" in the Codex Bezae, whose readings usually reflect the conditions of the 2nd century of our era in Asia Minor. This use of the term was of course political and administrative; Antioch continued to be a city of Phrygia in the ethnical sense and a recently discovered inscription proves that the Phrygian language was spoken in the neighborhood of Antioch as late as the 3rd century of our era (see also Calder in Journal of Roman Studies, 1912, 84). Paul crossed Pisidia on the journey from Perga to Antioch referred to in Acts 13:14, and again on the return journey, Acts 14:24. Of those journeys no details are recorded in Acts, but it has been suggested by Conybeare and Howson that the "perils of rivers" and "perils of robbers" mentioned by Paul in 2 Corinthians 11:26 refer to his journeys across Pisidia, and Ramsay has pointed out in confirmation of this view that a considerable number of Pisidian inscriptions refer to the armed policemen and soldiers who kept the peace in this region, while others refer to a conflict with robbers, or to an escape from drowning in a river (The Church in the Roman Empire, 23 f; compare Journal of Roman Studies, 1912, 82). Adada, a city off Paul's route from Perga to Antioch, is called by the Turks Kara Baulo; "Baulo" is the Turkish pronunciation of "Paulos," and the name is doubtless reminiscent of an early tradition connecting the city with Paul. Pisidia had remained unaffected by Hellenic civilization, and the Roman occupation at the time of Paul was purely military. It is therefore unlikely that Paul preached in Pisidia. Except on the extreme Northwest, none of the Christian inscriptions of Pisidia-in glaring contrast with those of Phrygia-date before the legal recognition of Christianity under Constantine. Murray, Handbook of Asia Minor, 150;; Ramsay, The Church in the Roman Empire, 18;; Lanckoronski, Stadte Pamphyliens und Pisidiens; Sterrett, Epigraphical Journey and Wolfe Expedition. A few inscriptions containing Pisidian names with native inflections have been published by Ramsay in Revue des universites du midi, 1895, 353;. PISID'IA, a district of Asia Minor, n. of Pamphylia and s. of Phrygia, see map No. 7.